First cut a 6' x 9" piece of Blackberry Bliss card stock and fold it in half for the base, a 4 1/4" x 5 3/4" piece of white for the front layer and a 2" x 4 1/4" piece of designer paper for the bottom strip. 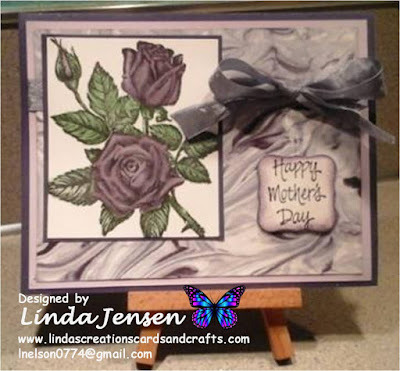 Then using a stamp positioner, stamp the flowers in Stazon Jet Black ink. Then color the blooms with an aqua painter and Blackberry Bliss and leaves with Old olive ink pads. 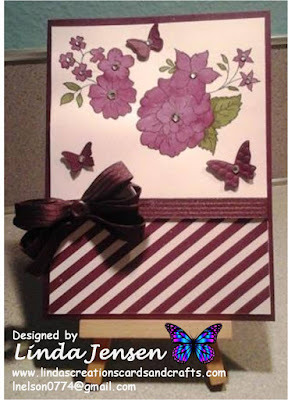 Next cut out the butterflies using a Stampin' Up! Beautiful Wings Embosslit and attach them with mini pop dots. Then attach the strip of Stampin' Up! Moonlight Designer Series Paper to the bottom and the ribbon by adhering a piece of ribbon to the back of both sides of the card stock then create the bow using a Mini Bowdabra and add a button to it's center. Finally add the self adhesive rhinestones, attach the front layer to the base and enjoy!